dB- Decibels, are common for how much a human ear can hear at different frequencies. 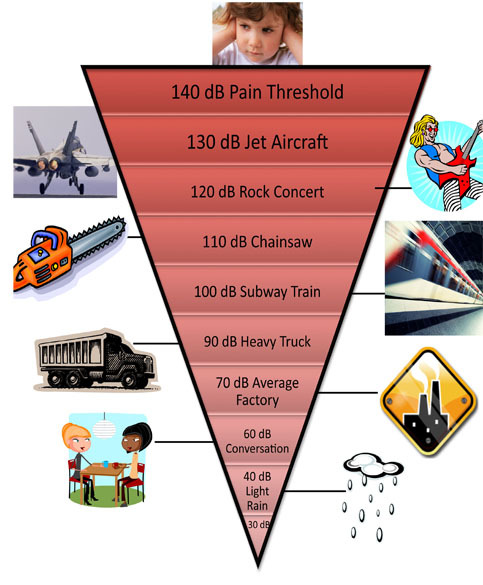 Decibels range from 50 dB, a normal conversation, to 110, a chainsaw. Any decibel over 130 will cause serious pain. Fire Rated- Class A, B, C fire rating just tells how long something can withstand fire until it catches. Class A Fire Rating means it has the lowest fire spread rate and the most resistance to fire. Most of our products are fire rated. IIC – Impact Insulation Class is a universal rating of how well any floor reduces impact sounds, such as footsteps, jumping, or dragging/dropping of objects. MLV- Mass Load Vinyl. For more information on Mass Load Vinyl, or MLV see our Sound Barrier Page. Noise Abatement- The way to reduce noise pollution within an area. One way to reduce the noise is to use Acoustical Panels within the area. This helps the reverberation of the noise, and absorbs the noise so that it will reduce it. NRC- Noise Reduction Coefficient, is a common rating that tells how much a sound absorption material can absorb. The higher the NRC, the more noise it will absorb, but the lower the NRC, the less it absorbs. PSA- Pressure Sensitive Adhesive is a special, tough, adhesive that we put on the material to adhere it to multiple surfaces. It can be put on metal, wood, cement, fiberglass or more. Our Sound Barrier can come with a PSA backing. R-9, R-13, R-19- Insulation Rating, to show how much heat it can retain. Normal household fiberglass insulation is R19, the same as our Quiet Insul. For more information on how to keep heat in your house, and the cold outside, check it out. Our Quiet Insul meets the required thermal insulation for your house, and also absorbs sound better than any other spray or fiberglass insulation. SQFT – Square Foot, or Per Square Foot. We commonly use it to gather how much material is needed for the project. STC- Sound Transmission Class is an American ASTM Standard for measuring airborne sound. The higher the number, the better the material is for sound blocking. So a wall that is rated for an STC of 50 is better than a wall with an STC rating of 20. Normal speech has been reported around 20 STC, meaning you would need something that is rated for 20 STC or more to block normal speech. Our Sound Barrier has the highest STC rating. Transmission Noise- Physical Noise being produced that travel through walls, ceilings, and solid objects. UL Approved- Underwriters Laboratories Approved, a certification that is done by an independent product safety certification organization. Underwriters Laboratories is recognized throughout the United States as being a Certification of Safety and is in the same category as U.S. Federal Agency Occupational Safety and Health Administration (OSHA). OSHA maintains a list of approved testing laboratories, known as Nationally Recognized Testing Laboratories, in which Underwriters Laboratories is one of them. A lot of our Products are UL Approved. Soundproofing is the act of reducing the noise from leaving or coming into a room. New England Soundproofing can help reduce any noise that you want from leaving, or entering in your room. This can be done in home or office, residential or commercial settings. Acoustics is the noise within the room, and how the sound is transmitted in it. New England Soundproofing can help the acoustics within the room with the acoustic panels. This helps bring any reverberation within the room to help better the quality of sound within the room. What’s the difference between soundproofing and acoustic treatments? Acoustical treatment is treatment of the sound within the room. This means that the noise that you want in the room is treated in a way that will reduce any reverberation and will give you the best quality sound within your space. Soundproofing is specifically designed to reduce any noise that enters or leaves the room. Soundproofing will help block noise, so that you can live in peace and quiet. What is the best material to start soundproofing with? The best material that is offered for soundproofing is MLV or Mass Loaded Vinyl. We offer it as Sound Barrier HD (1/4’’ thick), Sound Barrier MD (1/2’’ thick) and Sound Barrier LD (1/16’’ thick). What the barrier is made to do is to stop any airborne noise from coming through the wall. This barrier has taken the place of lead, which was used for proper soundproofing years ago. Sound Barrier has different weights to it (HD is 2 lb/sf, MD is 1 lb/SF, LD is .5lb/SF) but in all, is a way to add mass to your wall without taking up space. Will using extra insulation in the walls or ceilings help me soundproof? Extra insulation will not help soundproof your wall. Insulation does not have the properties for soundproofing like other products (Sound Barrier, Sound Clips, ect). Our Sound Insul does have acoustic properties to help absorb any reverberation within the wall cavity. Fiberglass insulation does NOT have this property. How well does Green Glue work? Green Glue works, but is not the best solution. Many clients have said they did green glue and it does not work. Green glue works in only applications of small noise that is coming through the walls. Green glue WILL NOT help with any impact noise coming from your walls or ceilings. Also, with a high decibel, Green Glue will not reduce it as much as our MLV Sound Barrier. Green glue is good, but we have seen many unsatisfied customers because of the cost of the product compared to how well it actually works. Green Glue dampens the sound, but does not block it. Soundproofing costs can vary from $1.60+ for the material. We usually tell our customers that proper soundproofing would cost around $4.00+ and that includes insulation, sound barrier, and tape. Other costs would include demo, clips, channels, thicker MLV, installation, caulking, etc. How long does it take to soundproof? Soundproofing from start to finish does vary depending on the size of the job. A 10 x 8 typical wall that is being retrofitted for soundproofing usually takes about a week. Usually, we tell our clients that the first day is for prepping and demolition of the existing wall, the second day is for installing the soundproofing materials, the third day is for blue board and plaster, the 4th day is for drying of plaster/finish plastering. And the 5th day is for painting the wall. After that, your wall is completely finished and ready for the homeowner. Bigger jobs could take longer, and every job has its differences in length. Can soundproofing be done by anyone? If you are handy, or can swing a hammer, then you can soundproof. Installing the soundproofing products that we offer is simple and our products do come with instructions that are easy to use. Anyone that is handy can install them. It is important that you follow the instructions (or ask questions of any of our consultants) and follow the instructions. Proper soundproofing starts from proper installation. Installing the products is the most important part and though simple, you must do it right. But don’t worry, calling New England Soundproofing and talking to our consultants will ease the installation process. Is there a spray material that I can spray into my walls to soundproof them? No there is not, and don’t be fooled by people that say there is a product to do this. We have seen many customers fooled by insulation companies saying they can soundproof, but cant! The reason for this is because spraying something in the cavity doesn’t guarantee that you will fill the cavity completely, and sound will come right through those gaps. Spraying something in a wall, when you don’t know where it's going, is a bad idea. Taking down the wall and installing proper soundproofing products to make a complete seal is the best way to properly soundproof. Does New England Soundproofing consult, sell, and install the soundproofing products? Yes, New England Soundproofing can consult, sell, and install the soundproofing products. We have many years of experience and specialize in soundproofing. We can do everything from start to finish, or just install the appropriate soundproofing products.